The second newsletter of PHOWN project has been produced. In the six months of running, over 550 records have been submitted to PHOWN. 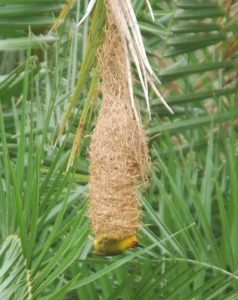 The species with the most records is the Southern Masked Weaver, followed by the Cape Weaver. The featured species in this newsletter is the Spectacled Weaver - it may be possible to obtain estimates of nest lengths from the photos. There are now records from all South African provinces. In addition to South Africa, there are submissions from Angola, Madagascar, Namibia, Rwanda and Zimbabwe. Submissions from all countries where weavers breed are welcome. Some interesting records are highlighted in the newsletter. Read it here.